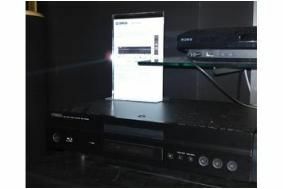 BRISTOL SHOW 2010: Yamaha reveals £450 BD-S1065 Blu-ray player | What Hi-Fi? It's Profile 2.0, supports BD Live and Bonus View, has full HD audio decoding onboard and a 7.1 analogue output for connecting to older AV receivers. Direct bitstream and multichannel linear PCM soundtracks can be output via HDMI, and the player uses 192kHz/24-bit audio DACs. There's support for x.v. colour and Deep Colour, 1080p upscaling of standard-definition sources and HDMI CEC functionality. Not on show here at Bristol, but also on sale now, is the £550 BD-S1900 Blu-ray player. The spec is similar to that of the 'S1065, with the added benefit of gold-plated terminals and a Pure Direct mode for music listening.